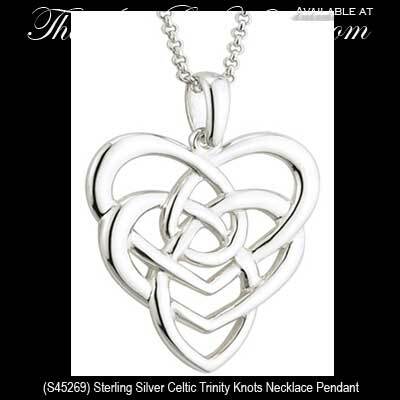 Celtic mother's knot is featured on this large sterling silver necklace that is enhanced with an intertwined heart design. The Celtic mother knot necklace has the appearance of 2 hearts made of open knot-work. One heart is lower than the other and both hearts are intertwined in a continuous Celtic knot motif.The Celtic motherhood knot is a stylized Trinity knot depicting a parent and child embrace. Combined with the Trinity knot, it is a true testament to the enduring bond between a mother, her child, faith and their heritage. The sterling silver Celtic motherhood knot necklace features an intertwined filigree design of the Trinity knot along with two hearts. The Celtic mother's knot pendant is a heavy design that measure 7/8” wide x 1 1/4” tall, including the jump ring and the chain bail, and it includes an 18” long sterling silver chain. This Irish necklace is made in Ireland by Solvar Jewelry and is gift boxed with Celtic knot and Celtic motherhood knot history cards, compliments of The Irish Gift House.